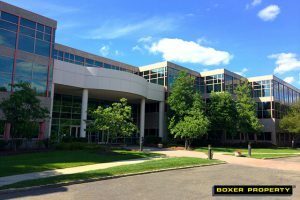 July 21, 2016 (EAST HANOVER, N.J.) – Boxer Property is wooing prospective office space tenants of 120 Eagle Rock Avenue with an impressive array of capital improvements, set to be completed October 1. Among the additions are a 3,000-square-foot fitness center that includes locker rooms, nine exercise machines, free weights, and a yoga area; a state-of-the-art training facility with 25+ seats, movable desks, monitors, and whiteboards; and a renovation to the on-site café, incorporating it into the company’s Tenant Center. The company is also completing a buildout of more Boxer Workstyle offices, adding to the 18 previously completed and leased. These innovative executive suites give entrepreneurs, freelancers, and small businesses the ability to lease individual offices at a fraction of the price of traditional office space. Workstyle tenants get the benefits of a collaborative, professional environment and access to amenities typically reserved for larger corporations. Conveniently located near I-280, the East Hanover property features 177,820 square feet, a two-story atrium lobby, granite floors, a reflexive glass curtain exterior and beautiful fountain pond. Since Boxer Property acquired the property, 39,095 total square feet has been leased, including over 4,000 square feet of Workstyle space. The Kessler Foundation recently leased 30,000 square feet of space here, commencing early fall. Boxer Property is celebrating 24 years as an innovative commercial real estate investment and management company that specializes in maximizing the value of under-performing properties through aggressive leasing and hands-on management. Founded in 1992, Boxer Property is a private firm based in Houston with more than 15 million square feet of commercial real estate nationwide.